Manama, Mar.16 (BNA): HH Shaikh Khalid bin Hamad Al Khalifa, First Deputy President of the Supreme Council for Youth and Sports, President of Bahrain Athletics Association, President of the West Asian Athletics Federation and President of Bahrain Athletics Association, honoured the winners of the night half-marathon which held under the patronage of HM King Hamad bin Isa Al Khalifa. The event witnessed the participation of a broad range of elite sportspeople from all around the world. The events of the race were followed by HH Shaikh Khalid bin Hamad Al Khalifa and HH Shaikh Nasser bin Hamad Al Khalifa, Representative of His Majesty the King for Charity Works and Youth Affairs and President of the Supreme Council for Youth and Sports as well as Shaikh Khalifa bin Ali bin Khalifa Al Khalifa, the Southern Governorate Governor. Youth and Sports Affairs Minister Aymen Al Moayyed and Abdulrahman Sadiq Askar, Assistant Secretary General of the Supreme Council for Youth and Sports attended. HH Shaikh Khalid triggered the starting signal of the race which covered a distance of 21.1 km for men and six km for women. At the end of the event, HH Shaikh Khalid crowned the winners in both categories. On this occasion, HH Shaikh Khalid expressed his utmost appreciation to HM King Hamad bin Isa Al Khalifa, for sponsoring this race which was the first of its kind at Bahrain and regional levels, stating that HM's backing was a source of pride and gratitude from all the sportspeople in Bahrain. HH Shaikh Khalid affirmed that HM's support for such events reflects the kind of interest and care the athletics sports enjoy in the Kingdom of Bahrain. He praised the support of HH Shaikh Nasser to athletics in the Kingdom of Bahrain, hailing the success the night half-marathon achieved. 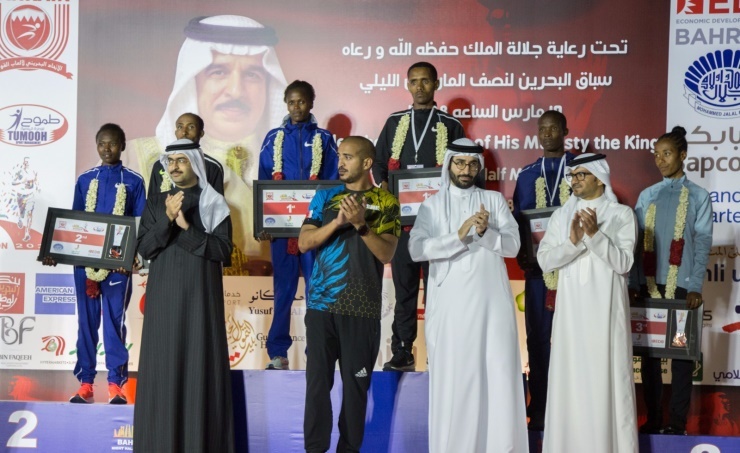 It's worth noting that Abadi Hadis of Ethiopia won first place in the men's category, while Kenyan athlete Bresig Coseji emerged first in the women's class.